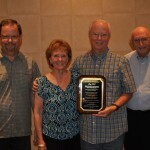 Terry White was honored by the Association of Grace Brethren Ministers on Sunday with the Lifetime Achievement Award. He is picture with his wife, Sharon. 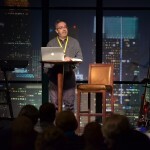 Alfredo Abreu, ministry partner in Portugal with Encompass World Partners, spoke to Vision2020 South on Sunday night. Dave Lawson, left, moderated a discussion about church planting in the Fellowship of Grace Brethren Churches. Tony Webb and Jose Marquez participated. 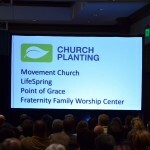 A panel on church planting highlighted various ministries in North America. 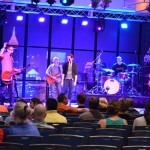 The worship band for Vision2020 South is comprised of musicians from several Grace Brethren churches. 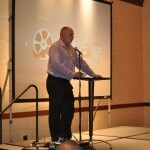 Dave Lawson of the Grace Brethren Church in Wooster, Ohio, is the master of ceremonies for Vision2020 South. 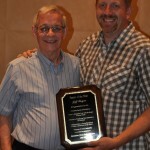 Pastor Bob Combs, left, presented the Pastor of the Year award to Jeff Bogue. 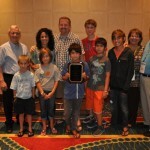 Jeff Bogue was named Pastor of the Year by the Association of Grace Brethren Ministers. He is pictured here with his wife, Heidi, and their six children, and his in-laws, Pastor Norm and Ann Johnson, Ashland, Ohio. Jeff is pastor of Grace Church, a multi-site Grace Brethren congregation in the Akron, Ohio, area. Also pictured is Pastor Bob Combs, left, who made the presentation. 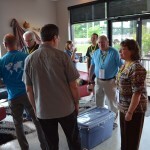 Tim Boal presided over the Go2 breakfast, which included church-planting updates and a corporation meeting. 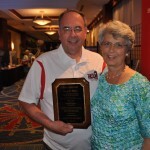 Jay Bell was recognized by the Association of Grace Brethren Ministers with the Excellence in Ministry Award. He is pictured with his wife, Jan, and with Tom Julien, right, and with Dave Guiles, who presented the award. 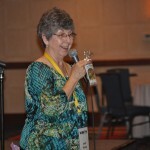 Janet Minnix presided over the Women of Grace meeting. 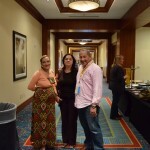 The Hispanic church plant in Atlanta hosted a dinner in Sunday afternoon. 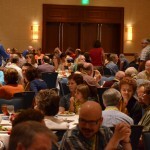 The Association of Grace Brethren Ministers hosted the pastors and wives dinner on Sunday afternoon. 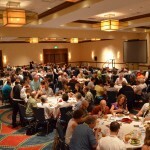 AGBM hosted the dinner for pastors and wives. 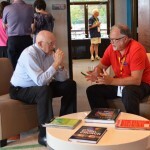 Conversation during the Encompass Open House. 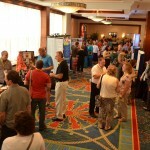 Conference attendees enjoy the Encompass Open House. 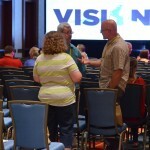 There is plenty of time for Fellowship at Vision2020 South. “Jesus. It’s all about Jesus,” said Alfredo Abreu as he challenged the national conference of the Fellowship of Grace Brethren Churches Sunday evening. 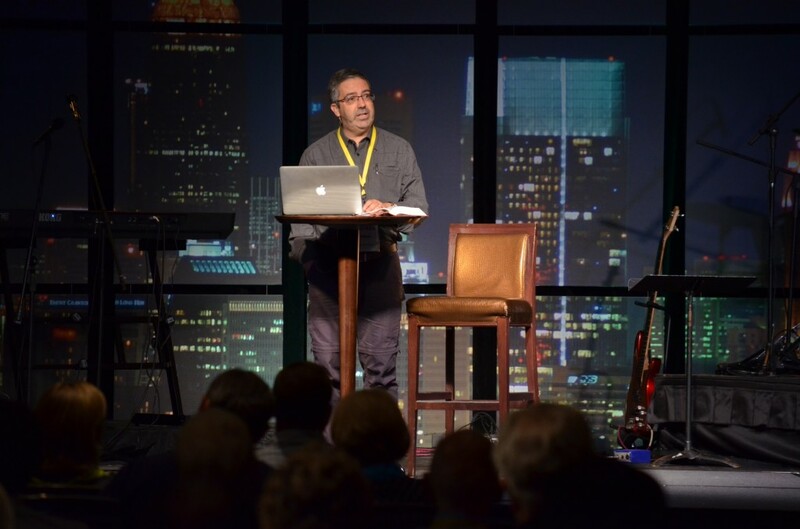 Abrue, an Encompass World Partners national ministry partner in the country of Portugal, talked about “An Imaginable Church to an Unimaginable World.” His talk centered around three words: Jesus, You, and We. “You are God’s people in this nation,” he concluded. “You are not bound by the nation. If there are more difficulties, turn around. Ask God to give you more abundance. He closed by reading Hebrews 6:9-12, the words of which appeared on the screen to either side of the platform. During the evening service, four congregations were informally welcomed into the Fellowship of Grace Brethren Churches. Each received a “good faith” gift from the Grace Brethren Investment Foundation, which was presented by GBIF executive director Ken Seyfert and Brenda Byers, director of Finance. The new churches include: Movement Church, Hilliard, Ohio (Mark Artrip, pastor); LifeSpring, Twinsburg, Ohio (Ron Boehm, pastor); Point of Grace, Leonardtown, Md. (Arthur Shepherd, pastor); and Fraternity Family Worship Center, Sunrise, Fla. (Odiclair Joseph, pastor). 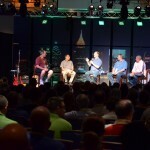 A panel of church planters also discussed the development of new congregations in the FGBC. On the panel were Nathan Bryant, executive director, GBCanada; Tony Webb, executive director, VisionOhio; Jesus Munoz, who coordinates Hispanic church planting in North America with Encompass World Partners, and Jose Marques, Hispanic church planter in Atlanta, Ga. It closed a busy day in which conference attenders spread throughout the city to attend worship services at various churches. 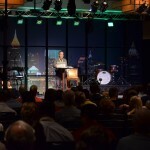 Some attended megachurches within a short distance of the conference hotel. Others attended Grace Church Town Center, a Grace Brethren congregation in Kennesaw, Ga., about a 30-minute drive north of the city. 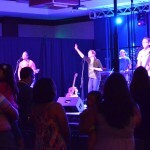 About 250 people stayed in the hotel and participated in an ethnic worship service led by pastors in Hispanic, Haitian, Indian, and other ministries. 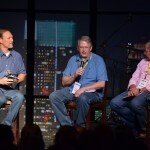 During the annual meeting of the Association of Grace Brethren Ministers, three men were recognized for excellence in ministry and longevity of service. 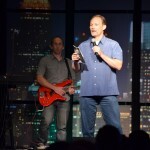 Jeff Bogue, pastor of Grace Church in Akron, Ohio, was honored as the Pastor of the Year. Jay Bell, who is retiring from ministry with Encompass World Partners this summer to take position with the Winona Lake (Ind.) 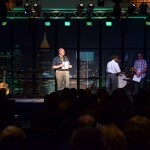 Grace Brethren Church, was recognized with the Excellence in Ministry Award. Terry White, former executive director of the Brethren Missionary Herald Company, was honored with the Lifetime Achievement Award. 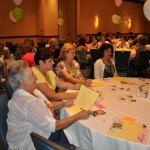 Women of Grace held their annual meeting Sunday afternoon, as well, celebrating 100 years of the SMM (girls’ ministry) program. 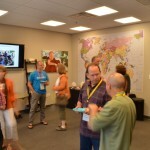 Also on Sunday afternoon, the staff of Encompass World Partners welcomed conference attendees to their new Atlanta headquarters. 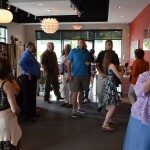 Guests swarmed through the various offices, enjoying fellowship and sweet treats. 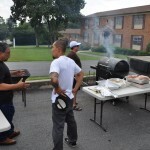 Not far away, the Grace Brethren Hispanic church plant, led by Jesus Munoz and Jose Marquez, hosted a lunch for many of the ethnic pastors and friends.